Q. How Do I Search For Full-Text Scholarly Articles Online? 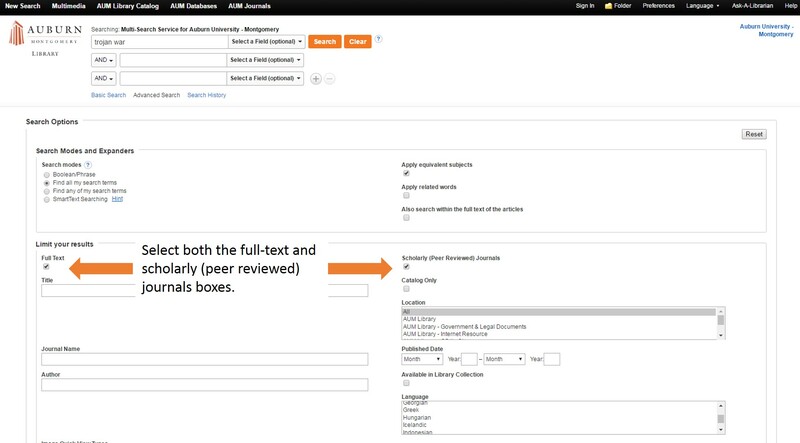 To get full-text electronic articles, start with the AUM Library search feature and enter your search terms. Make sure the full-text and scholarly journals boxes are selected. Then you can click on the search button. This will bring up the results. If you have any questions, please stop by the Reference Desk on the 2nd floor or call us at 334-244-3649 or text us at 334-384-1851!